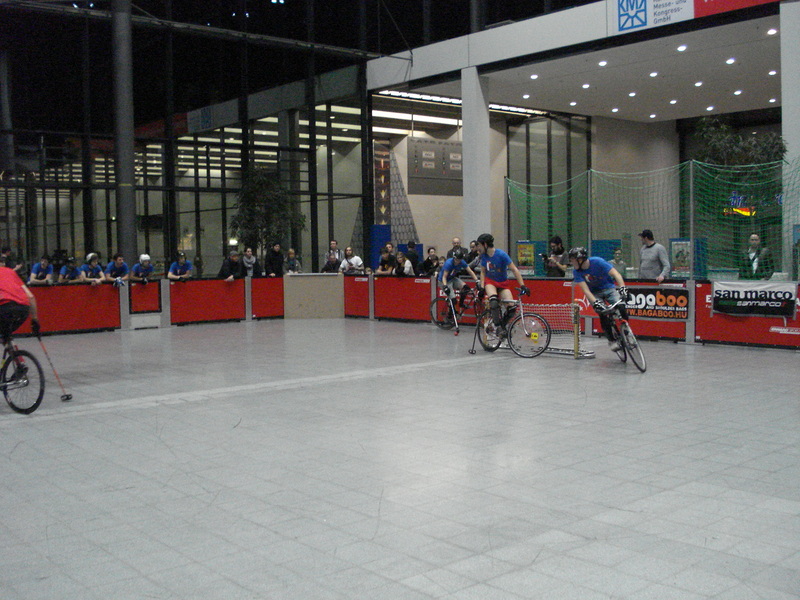 Greifmasters Final: Switzerland v France | Birmingham Hardcourt Bike Polo, UK. The first 15 minutes set the tone for a close game, with the score creeping up to 3-2 to the Swiss. Then a full Equipe lineup come on, pressing for an advantage, playing 3-up. First Manu, then Mario score in quick succession, bringing the score to 5-2. Equipe look dominant despite a strong French team always looking to poach long-range goals on an often un-goalied net. Manu gets one more (6-2), and Equipe leave the court. Job done, for now. Almost immediately, Marc finds his range with a long-range/open-net goal (6-3). The Swiss scrap their Equipe-ish 3-upmanship. Sensing their chance to draw level, the French step up the pace and aggression of their game. The Swiss keep rotating and the speed of the game rises to a new high. 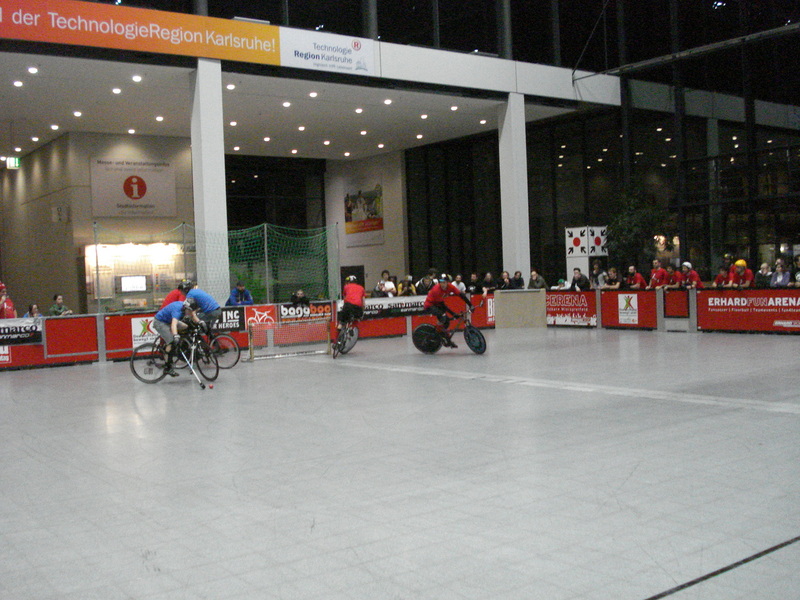 Players sprint out of the saddle to cross the court! In the last three minutes of the half, Manu comes on again and the play remains fast and hard, with several big crashes. Marc was begins to look more confident, creating some good moves with his teammates and the score edges back to 6-5, with the Swiss still leading at half time. After a 5-minute break, Equipe start, looking for another strong opening. It is becoming obvious that in this game, Equipe are crucial for the Swiss team. However, Marc continues his run, bringing the score back to 6-6. 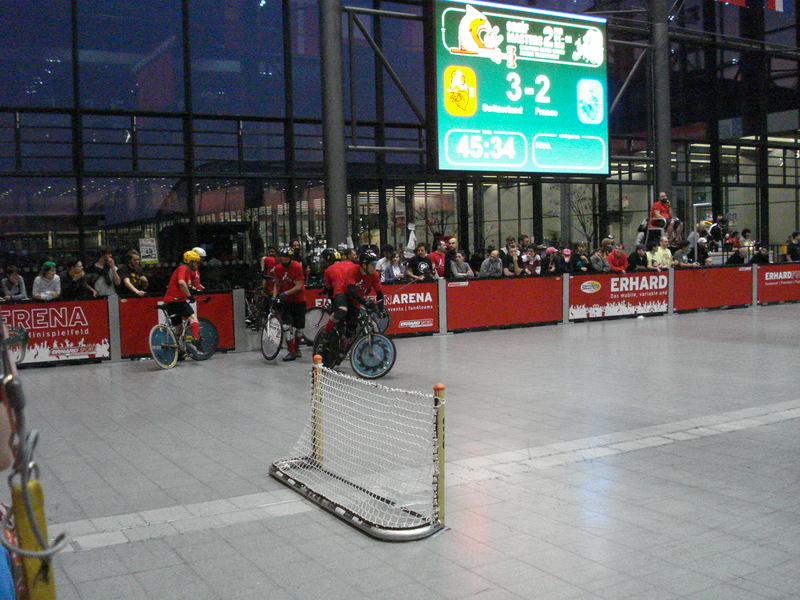 Manu responds (7-6) but shortly after Mario is given a 1-minute penalty by the referee (Rik) and Hugo quickly capitalises (7-7). At this level, being a player down, even for a few seconds, is a huge disadvantage. Mario comes back on, but with everything to play for, the game is getting uglier. The ref tries hard to control the game, and pretty much succeeds. Both teams respect each other enough not to try any dirty tricks, but also don’t want to give up any ground. 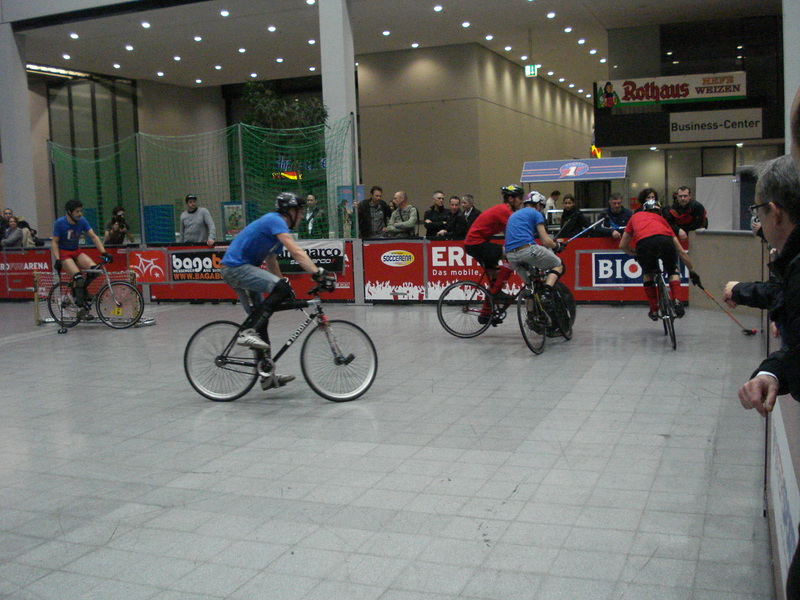 Mario and Greg exchange quick goals (8-8) and shortly after Lucas honourably conforms to the voluntary double-tap rule after accidentaly putting his mallet under another players’ front wheel. Really good to see that despite some ugliness from other teams earlier on in the tournament, good-sportsmanship reigns when it really matters. Full-credit to the French, they’re sticking to their style, with consistent defence and a constantly-covered goal, they’re not ranging too deep into Swiss territory in desperation for the lead. In their place, Clement is Switzerland’s main attacking threat, making several promising breaks, but failing to score. He’s visibly frustrated; it looks as though the pressure is getting to him, and as a team they look vulnerable because of their love of playing three-out. Sure enough, France score (9-9) on an open net from their own half, with only 14 minutes remaining. Manu comes back on, but tries perhaps a little too hard, dominating possession and rattling off futile shots. With him on the court the pace peaks and he makes another big shot; Clement takes the rebound (10-9). Soon after though, the same player leaves his front-door open in goal and concedes a Hugo long-ranger (10-10). …Which duly come. Marc scores a blind shot from inside his own half (10-12), and scores a freak-shot which deflects off the goalies chainring, over the line then way back out of goal again. An astute goal-ref confirms: 13-10 to France. In the dying minutes, Marc relaxes into some showmanship, making an incredible wheel-pass which almost results in a goal, and Manu misses a consolation 1-on-1. It’s over. 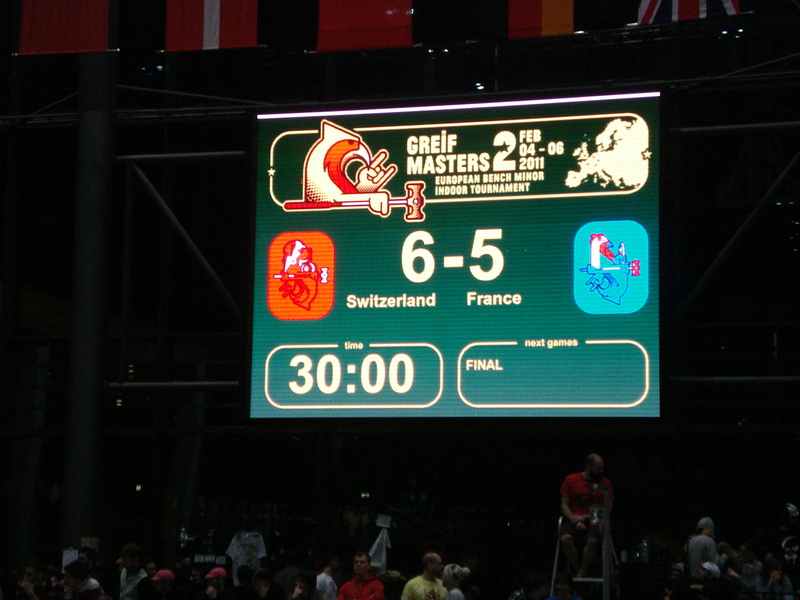 Final score, France 13 – Switzerland 10. It was a well-deserved win for the French, who gelled as a team better than any other nation/city. Perhaps a bruising and emotional game with Spain helped bring them together, but the role of their captain, Greg, can’t be understated. (Ben and I came up with a great team name – The Napoloeonic Complex). The were cohesive, had a very deep team to call upon with a solid defence (especially goalie!) and they stuck to their game when things looked to be going against them. Marc put in a great performance in the final, showing great vision and awareness to get many of his team’s goals. ﻿﻿Congratulations! First complet half with 3 camera comming this week. Awesome, I can’t wait to see it. Thanks for reading!